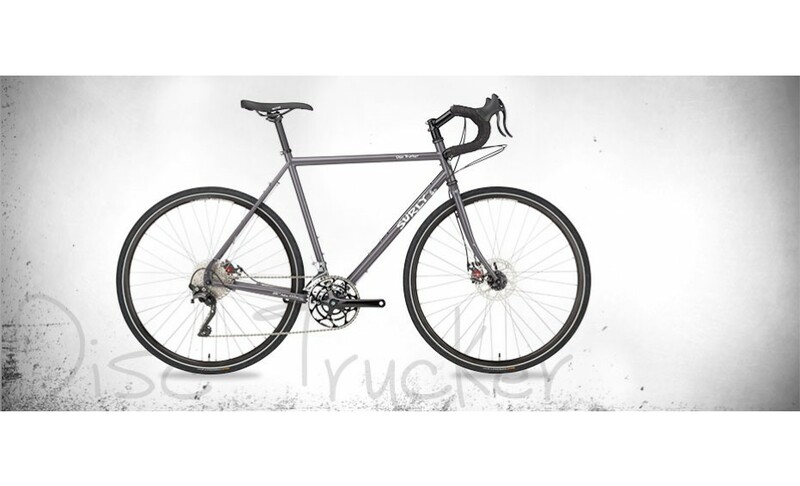 Our Long Haul Trucker enjoys a reputation as one of the best riding and most value-packed touring bikes out there. It’s been around long enough to be tested in the real world, in all kinds of places, with all kinds of loads on all kinds of roads. Sometimes, however, a combination of load, climate and terrain demands a bit more braking performance than a standard rim-brake LHT can provide. That’s where the Disc Trucker comes in. Disc Trucker is a Long Haul Trucker specifically designed for the unique forces discs impose. We’ve made sure it can run discs, racks, and fenders with no jury rigging, a somewhat unique feature we’ve just now decided to call Simulpatibility. Most of the components on the complete bike are the same as the standard LHT, parts chosen for their balance of technical capability, durability, and value. The drivetrain uses the sort of wide gearing you will need for loaded and unloaded travel, cable operated disc brakes for their proven reliability and ease of service, and hubs that are durable and easy to maintain. You’ll need to outfit it with the extras you want, like fenders and racks. We don’t include that stuff because everybody’s needs are different. From the casual commuter to the person who rides around the world more than once, the Disc Trucker is more than capable. It’s a tool designed from the ground up to take you and a bunch of stuff just about anywhere you’d like to go. It is a tool to help you get lost and find yourself.